In many ways the Olympics came home to London as Jacques Rogge rightly said; as it was here that Baron Pierre de Coubertin helped formulate his plans for the modern movement with inspiration from British Friends and contacts. Great to see my favourite A Blush of Rose colours in the signature branding. We are the Golden nation by the Silver Sea :-) Well done team GB for an impressive Medal haul. There was a significant role played by fashion in setting the stars on their way for great success. Team GB where very ably equipped by Stella McCartney. She did team GB very proud with modern combinations getting plenty of Blue, White and Red in there and all looking simple, clear cut and straightforward for our winning guys and girls. The Italians where turning heads at the opening ceremony as usually do with a brilliant Giorgio Armani suite of tayloring. Bella Italia on legs. Team GB Looked great. I like Stella's clothes I've met her and her sister Mary a few times but I really have to say I loved 'Team Armani's' look the also. Let's share that Gold Medal for fashion perhaps. We are generous Brits afterall. The Americans where kitted out by Ralph Lauren and looked preppy and very happy. A wonderful shop window for American East Coast style. I got a close up of the Ralph Lauren Riding Kit out at Greenwhich park where I was able to watch the Team Show Jumping Final. 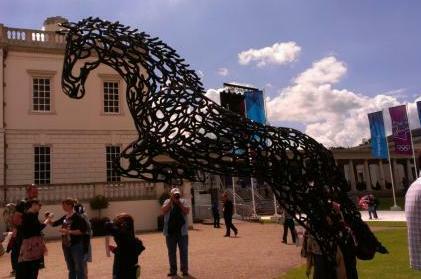 I love being around horses and it's interesting how much equine related fashion floats around on the high street. 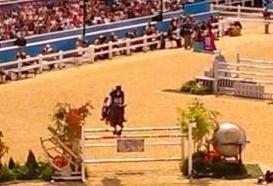 Another GOLD for Team GB and I had a seat right in front of the final jump off fence. Back to clothes. I think the riding - style stretch leggins are everywhere because they are really practical and show the figure well. My favourite ones are in Mole Skin colour and look quite like my riding Jodhpurs at first glance. If you match that with a plain light coloured shirt, my favourite is a pastel pink then you you have a very light smart combination. A good quilted light style Barbour Jacket will stand you in good stead for riding in Spring/Autumn in-between weather and is generally very handy. I think they're the perfect riding jackets. My boots are Wellygogs and they are my favourite all weather boots. V practical. 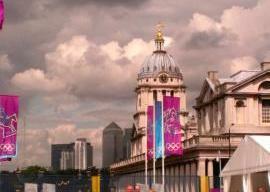 Background from the brooding Greenwich sky. A few flashes lightning didn't stop the fun. The Olympics Closing Ceremony had a Strong Fashion theme. Kate Moss reigned as the Golden fashion Queen. Naomi Campbell and David Gandy where a stellar Brit couple followed by Stella Tennant and Lily Cole, two ladies closley connected with the House of Chanel. Fashion is one of our best exports that we win Gold in. CHANEL Launch Pop-UP store in Covent Garden. Summer in the City can be fun fashion wise when you try and this Summer, with Olympics on the Horizon was no different. 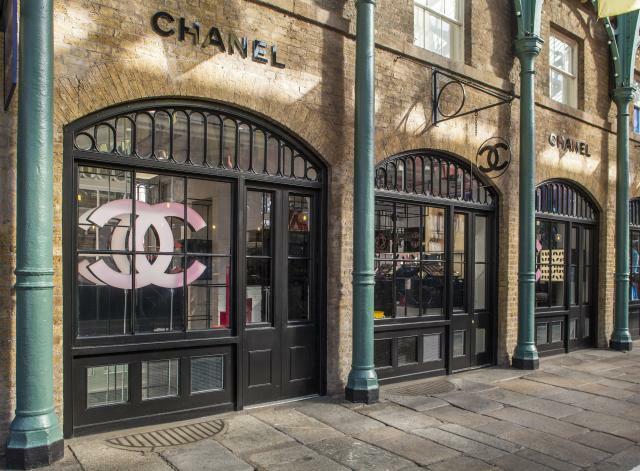 CHANEL stuck out from their home turf in the Chi Chi West End to launch a Pop-Up store in Covent Garden. (C) All CHANEL images with kind permission of CHANEL. This Boutique is an explosion of Colour and light, simplified in true CHANEL style. What hits you on entering is the sheer neatly placed mass of product that has been assembled with almost military precision. An 'Arsenale' of Make-up. Kind of like the way I refer to my own mountain of cosmetics at home. The store has a set-out like a Library-meets-playroom feel with banks of lip glosses and nail colours set out in a box-set casing or arranged in playful shapes on display. A plentiful team of colour technicians are on hand to give advise on the product range. Clad in Chanel Black with tools at the ready there is also a feeling of being on-set with the make-up artists ready to pounce and fix in an instant. Products are grouped by type eg nail, lip and foundations and I found this was very practical for shoppers as you can head towards what you are looking for quicker if you want somthing specific, or if you are browsing you get a big selection quick which helps you make your decision. It's not just show, there' s a method here. I would give this store 10/10 as a quick pop-in for some premium make-up and advice. 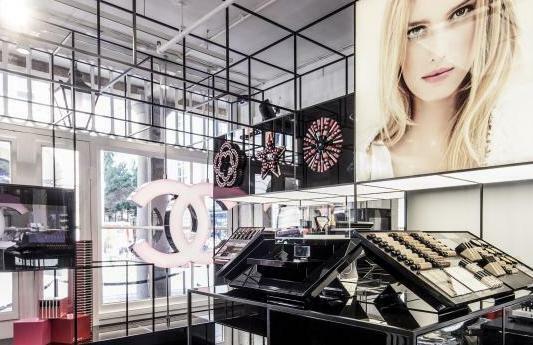 Way better than a department store concession for the sheer volume and variety of make-up that it has to offer. It would be great to see this popping up again elsewhere in the City but right now I can't think of a better place than Covent Garden for this new branch of the CHANEL tree in London. For some of us working in the City in the summer either side of our vacations is a mixed feeling. You look for light chemise pieces and dream of the beach, or the travelling that your're somehow working the rest of your time around. Alternativly I really enjoy the Summers in town, so much to do and in London we have those long light evenings that are a great for some evenings out. Well this Summer, I'm doing nothing radical at all. I think Chemise style, light blouses that a lot of women wore in the 70s and early 80s are pretty versatile and practical. with a slip underneath for a bit of modesty it's pretty much all you need above the waist. There's a huge selection to be found from Banana Republic to Donna Karen. The Navy/maritime staples of Navy Blue stripes and Whites work well for a lot of office wear and for casual drinks going into the evenings. If you've got a more formal night out the good news is that summer evening clothes are best kept light so not much to take with you for a quick change. A pretty essential piece of kit is the thin light cardigan or Jacket that you can slip over most things. One of my favourite buys of the Summer was a Beige/Fawn coloured one piece swim suit from The White Company. I bought it at their Original Sloane Street store and spent a few moments re-discovering the brand again. I haven't shopped their much until this year and the simplicity of their designs and branding really strike a chord for me now. The pre-autumn collections arrive in the stores before we know it and this year, in testing times, it's no exception. I've been very taken with some of the High-Fashion collections, Dior and Valentino do a strong pre-fall line this year which slip in effortlessly mid season. As we are in the era of almost year-round sales where designers and stores look to release as much current-season goods to the market as possible it's a better time than ever to find good pieces that can live long in your wardrobe; and if you do buy something at a premium it really should earn it's place for the long term.